Since its inception in 2002, Tiger Quick Change Rear Ends has used cutting edge technology to design and manufacture the highest quality strength to weight ratio rear ends possible. 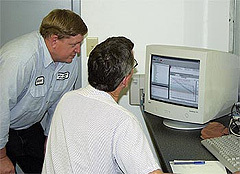 After dedicating years to building its reputation as one of the most esteemed and trusted rear ends on the racetrack, Tiger Quick Change founder Gerald Williams sold the company in 2007. In early May 2011, Williams announced that he had repurchased the company and moved Tiger Quick Change to its new home in Mt. Ulla, N.C.
Williams, along with all of the original employees, are dedicated to restore the focus and culture in which Tiger Quick Change was built on. 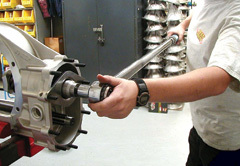 Each Tiger Quick Change is built for racers by racers with the highest standards of quality and workmanship. The entire staff now has the ability and drive to advance Tiger to a new height, and is dedicated to improve the service by focusing on satisfying all of the valued customers who have made Tiger Quick Change the benchmark in today’s quick change market. 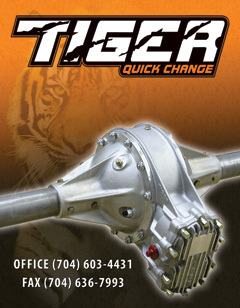 Tiger Quick Change also supports drivers in several of America's best sanctioning bodies and popuar touring series, including the American Racer USRA Weekly Racing Series, Dart Corn Belt Clash Late Model Series, UARA-STARS Late Model Touring Series, USMTS National Championship Series and WISSOTA Amsoil Dirt Track Series. To learn more about the advantages of Tiger Quick Change, view or download our catalog, call us at 704-603-4431 or email us. You can also like Tiger Quick Change on Facebook and follow us on Twitter. Put a Tiger in your tail ... and let us help put you in victory lane.